12.5" RCOS @ ~f/9 (2880 mm fl) 0.64 arcsec / pixel. The Zoomify image scale is 0.85 to 3.22 arcsec / pixel. CCDSoft, CCDStack, Photoshop CS6, PixInsight and Noel Carboni's actions. eXcalibrator v4.01 for (g:r) color balancing, using 32 stars from the SDSS-DR9 database. CCDStack to calibrate, register, normalize, data reject, combine the sub exposures and create the RGB image. 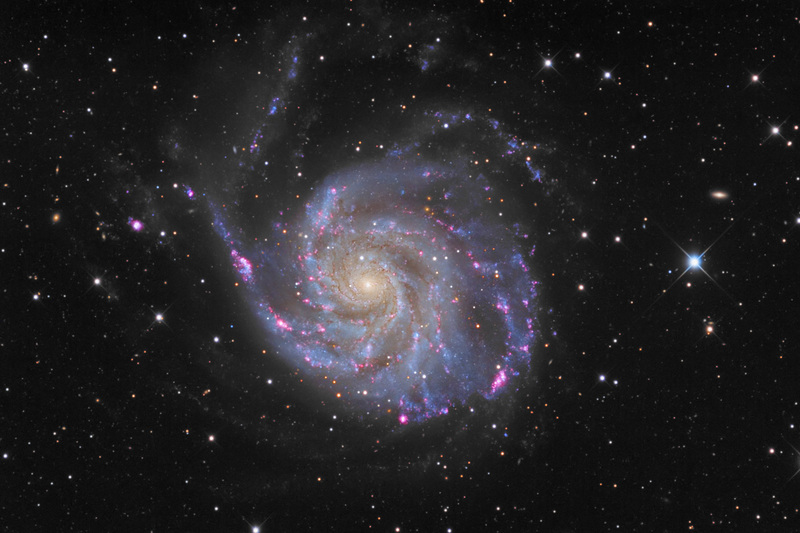 M101 was discovered by Pierre Méchain on March 27, 1781, and he subsequently communicated his discovery to Charles Messier who verified its position and added it to the Messier Catalogue. AT a distance of about 27 million light-years, M101 is a relatively large galaxy compared to the Milky Way. With a diameter of 170,000 light-years it is nearly twice as large. A remarkable property of this galaxy are its huge and extremely bright HII regions, of which a total of about 3000. HII regions are places in galaxies that contain enormous clouds of high density hydrogen gas contracting under its own gravitational force. Eventually, when the localized hydrogen contracts enough for fusion processes to begin, stars are born.